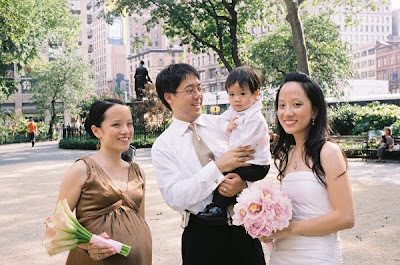 When I was planning my wedding several years ago, my sister announced that she was pregnant. I was really excited to have another adorable nephew, but I faced the challenge of finding an appropriate dress since she was due the same month as my wedding. Frankly speaking, most maternity bridesmaids dresses made even non-pregnant models look like whales. They didn't drape well and were unflattering. After much searching, I finally found a dress I loved for my bridesmaids that had a coordinating maternity option for my sister! 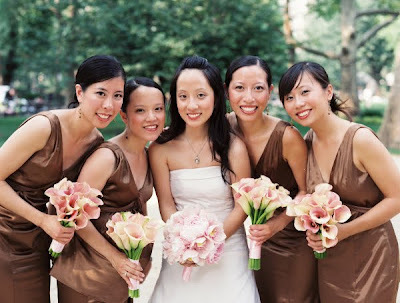 That's right, my bridesmaids wore Landa Designs bridesmaids dresses! The brand has cute designs, great quality and we are proud to carry their line. We especially love their maternity styles that a pregnant bridesmaid can feel beautiful and comfortable in. If a bridesmaid will be in the early part of her second trimester at the wedding, she may be able to wear a non-maternity dress in a larger size depending on the style of the dress,. We recommend choosing a dress in which the fabric and style have some give to allow for more flexibility. If she will be in the later part of her second trimester, she will need to wear a maternity dress, and can probably order one in her usual size. If she will be in her 3rd trimester, we recommend taking her bust measurement and ordering one size larger. If she is carrying twins, you might want to consider sizing up two sizes in the 3rd trimester and one size in the 2nd trimester. As a guideline: Landa's maternity dress size 8 measures 42-44" in the waist. As always, it's easier to have a dress taken in rather than let out. Please do not hesitate to contact us if you need help on deciding what size to order!